I am currently in the middle of my masters degree, specializing in transition to adulthood (because I like to see if I can make myself go crazy). For our kiddos with significant disabilities, I can not stress enough the importance of beginning to teach transition skills early. I strongly believe, and research backs me up, that transition planning should begin in middle school. It takes a long time for our students to master skills, and if we want them to be independent when they leave us at age 18 or 22, then we better start working on that independence early. One way to do that is through community based instruction. 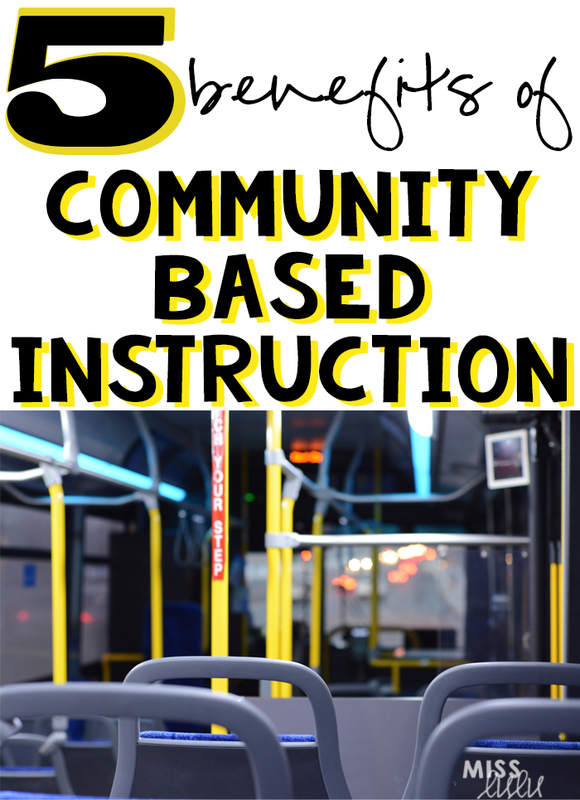 What is community based instruction? Community based instruction is exactly what is sounds like- instruction for skills needed in the community that's taught in the community. More specifically, community based instruction is regular and systematic instruction in meaningful, functional, age-appropriate skills in integrated community settings, using naturally occurring materials and situations. The goal is to provide a variety of hands on learning opportunities to help students acquire the skills they need to live in the world today. 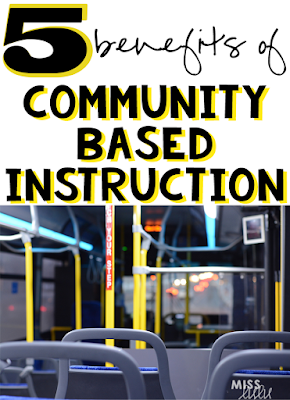 Community based instruction, or CBI, is different than a field trip. CBI is sustained and repeated instruction, where a field trip is a one time experience. CBI involves teaching individual and small groups of students academic and other content during activities that occur naturally in community settings. When done correctly, CBI should provide students with opportunities to interact with people in the community, such as employees and customers. 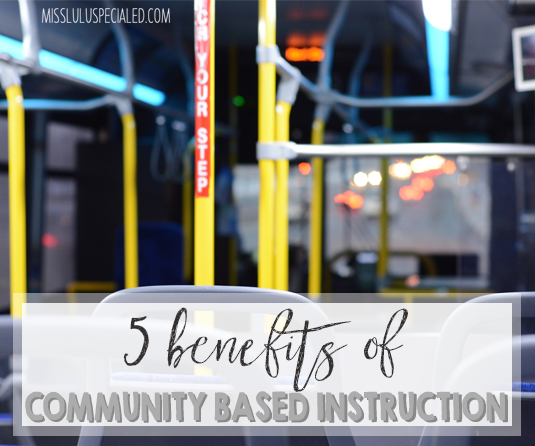 There are SO many benefits to community based instruction. Let's talk about a few of my favorites. 1. No need to generalize. Students taught in classroom settings are expected to generalize learned skills to other “real -world ” situations. Do you have students that can tell time on one of those unrealistic Judy clocks with 100% accuracy but can't tell time on a real clock to save their lives? This, my friends, is due to lack of generalization. It is so frustrating to think that a student has mastered a skill only to discover that he can only do it in one setting, or with one person. When we teach a skill in the natural setting through CBI, we eliminate the need for a student to have to generalize the skill. They learn how to perform the skill in the real life setting from the beginning. 2. It provides exposure and access to the community locations that we get to enjoy on a regular basis. The goal of special education is to provide access to education for everyone. This shouldn't be limited to school. Everyone, regardless of their disability, deserves access to the community. It's not something we have to earn. I don't have to complete my 40 hours of work each week before I'm allowed to run to McDonald's and buy myself an ice cream cone. Likewise, people with disabilities don't need to earn their way into the community by finishing school or with good behavior. It's a right that each one of us has. Unfortunately, our students with disabilities can be difficult to take out into community settings, and unfortunately, it's likely that their experience with their parents and family members in the community is limited. By using community based instruction, we are providing the access that all individuals deserve. In addition, we are able to teach those expected behaviors to hopefully make our families jobs easier and increase community access at home. 3. Student motivation is increased during CBI. I have never had a student who wasn't motivated by community based instruction because the students are involved in real life activities that are relevant to them. CBI is driven by the student's strengths and needs and students get to see the rationale for learning the skills they have been working on in the classroom. Using evidence based practices is always the best way to go and CBI adheres to IDEA legislative mandates. Need I say more? 5. Community based instruction increases awareness of the potential of people with disabilities. We, as teacher and paras, have the opportunity to model to our community how to interact with people with disabilities. We can show them how much they are capable of. We can show the community the amazing things that we get to see in our classrooms each day. What an amazing opportunity that is! For more information about CBI, Beakley, Yoder and West published a great 190 page resource that's available online. Just google "Community-Based Instruction: A Guidebook for Teachers" and grab a copy. AND to help you start planning, I'm hooking you up with a FREEBIE! 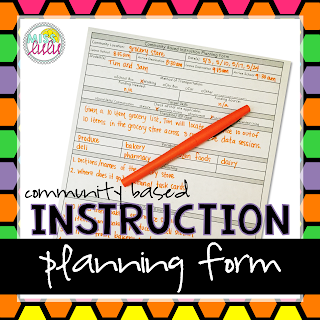 Here is the CBI planning worksheet that I use for my classroom. 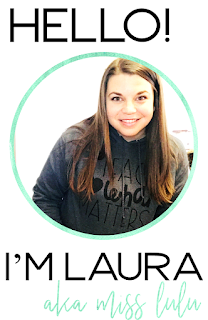 Make sure to follow my blog for upcoming posts about my adventures in transition, independent living and career exploration!